courtesy of Kat our wonderful co-ordinator this year. This year, Blogtoberfest will be hosted here @ I Saw You Dancing. This will be your HQ for creative prompts, insights and inspiration from guest bloggers, and quotes to get you thinking. Be sure to check in every day during the month, fill up your creative well, and let us know how you're travelling. 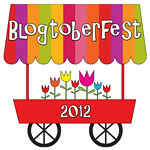 You are also most welcome to use the hashtag #blogtoberfest12 when you participate via twitter or instagram. The more media the merrier! Help yourself to one of these gorgeous blog buttons. If you are keen to spread the love and host a giveaway on your blog to celebrate Blogtoberfest, be sure to visit magnanimous Ms CurlyPops' dedicated giveaway page to sign up with all your details! for more information Kat will help. Nice to meet you! Thanks for the tip today! This is my 1° Blogtoberfest.